Lesley Jane Seymour is a media entrepreneur and founder of CoveyClub a new virtual club for life-long learners launched in February 2018. 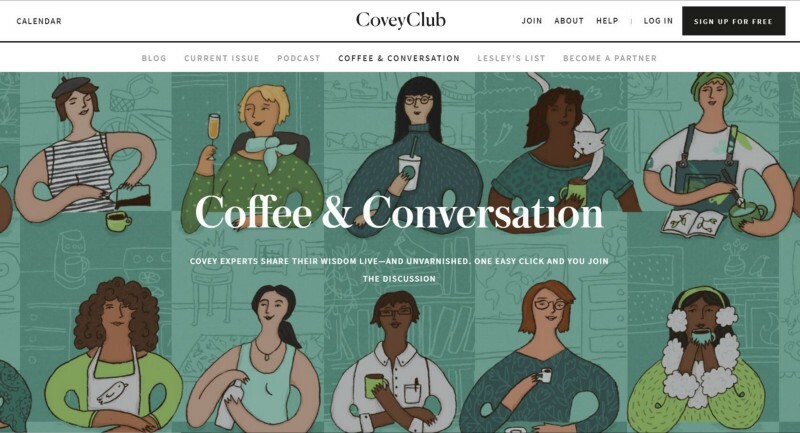 CoveyClub allows women to bond over issues of interest and concern through virtual salons (Coffee & Conversation) or topics in the CoveyClub monthly magazine which is written and produced by the best journalists around the world. Let’s start from the beginning. How did you decide to start your own company? What was the thought process, and what were you doing before? I have been a writer and an editor for 40 years — starting my career at Women’s Wear Daily, then the New York Daily News, Harper’s Bazaar, Vogue and Glamour. I began running magazines as Editor-in-Chief with YM (a teen publication), Redbook, Marie Claire and then More. CoveyClub was born after More magazine shuttered in February 2016 and 627 former More magazine readers reached out over my personal social media and asked me to create something special for them. “Make sure the content is relevant, intelligent, provocative, and unusual–where your unique voice is present,” suggested one of them. “I want evening events that will continue to help me connect with interesting women,” said another. I listened and created CoveyClub, an online/offline club for lifelong learners who want to continue connecting, reinventing and impacting the world. Nothing tickles me more than hearing that two people I set up or introduced who come from completely different backgrounds have done some interesting project together. Covey is a place where women can learn fabulous anti-aging beauty tricks, how to ask for funding for their reinvention, or how to boost their personal brand. At Covey, women can build long-lasting friendships for this new phase of their lives. There are virtual salons, a digital magazine that offers provocative, thoughtful, meaningful articles and essays on a monthly basis, and GIVE and GET networking that will introduce women to new business contacts and friends. There was nothing in the market for smart women who are not millennials and who want to continue learning and make an impact the world. And now there is with CoveyClub. How kind, nice, and generous everyone is. I am shocked that each time I meet with a stranger, they end up saying, “So, how can I help you?” and mean it. No one ever did that in corporate life. The biggest roadblock for me was going from a staff of 34–55 to just me. It is amazing how much natural momentum corporations have: it’s like a rushing stream, and all you have to do as a manager is jump into the stream in your boat and start paddling. Being an entrepreneur is totally different: every day you sit down at an empty dining room table and realized that you have to push the rock up the hill today or no one else will. You have to find ways to create momentum and invent processes that move your days along and bring structure to an amorphous work situation. When someone says your name, what do you want to be the description that follows? In fact, this already happened. I had one of my first CoveyClub events last February. It was a tiny 30 people get together at Bandier, the luxury workout clothing store, in NY. I had convinced Jennifer Bandier to let me interview her about being an entrepreneur and she invited us in to have an hour of yoga (the store has a studio), snacks and an interview with her, and then shopping with a discount. One woman who came, wrote to me later on and told me that she found the conversation with Jennifer so inspiring that she pulled the rip cord and started her own clothing business that she had been thinking about for years. She is doing well and having a blast — and she says it all happened because she came to a CoveyClub event. Wow. That made my year. I’d love to have thousands of women come to one of our virtual or real-life events and find their nerve to plunge into this next phase of their lives. What a reward that is for me. Being an entrepreneur is totally different: every day you sit down at an empty dining room table and realized that you have to push the rock up the hill today or no one else will. If people want to connect with you, how should they go about doing that? And what should they know ahead of time? Are you looking for something specific? Nothing tickles me more than hearing that two people I set up or introduced who come from completely different backgrounds have done some interesting project together. I love this. So, I love to meet anyone who is interested in, inspired by, or has a great story for CoveyClub. I’m also looking for a great business partner who is willing to work for equity. I’m still boot-strapping out of my severance pay. But we’re going big and I’d love to share it with someone who knows how to sell the business opportunities here which can be found in the “Become a Partner” or “Covey B2B” dropdowns in the navigation bar on the site. Anyone can reach me at lesley@coveyclub.com. And if you love to connect people too, you should consider joining Lesley’s List which is in the navigation bar on the site as well. It’s an invitation-only GIVE/GET networking list for women who want to get sh*! done. Connect with Lesley on Twitter: @lesleyjseymour and Instagram at: coveyclub.